This is a free sample lesson. Sign up for Magoosh to get access to over 200 video lessons. 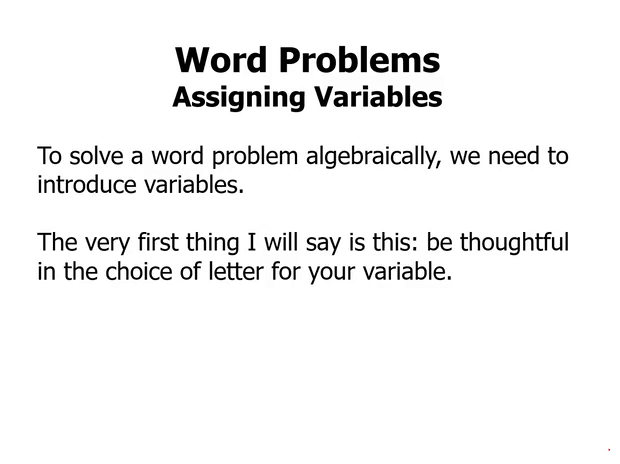 To solve word problems algebraically, we need to introduce variables. The very first thing I will say is this, be thoughtful in the choice of letter for your variable. It's true that algebra the math that we do does not depend on the letter at all. Nevertheless, you will make your life easier, and you will help yourself by choosing a meaningful letter. It will be helpful for you to choose a variable that, for example, begins with the same letter of the name of the person or thing for which it stands. Don't pick plain old x. This is a classic mistake that people make in word problems. They automatically pick x, and then what happens is, they're a bunch of variables in the problem, they pick x for one of them. They solve and then they get x and they're wondering, all right, well now I have this number, what is this number? Is this the answer or do I have to use this to find the answer? So they don't know when once they get the value, what it is that they've found. That's why it's much more helpful to pick letters that would represent the different items and different people in the situation. Here's the beginning of a sample problem. I don't have the whole problem here, but here we have three women, Sarah, Mary, Helen. If I pick x for the salary of one of the women, I may correctly solve for it, but when I get that number for x, how will I know whether it answers the question? I'll get that x, and then I might be wondering, now, wait, did I just find Sarah's salary, or Mary's salary, or Helen's salary? For this question, S, M, and H, would be much better variables for the weekly salaries of these three women. That way if I find S, I know exactly what I found, that sort of thing. Other considerations in choosing a variable. Sometimes it can be helpful to assign a variable for the smallest value and then express everything in terms of that. Sometimes, it can be helpful to assign a variable for the target value, what the question is asking. And the advantage of doing this is if you choose the target value as your variable, then as soon as you find the value, you're done, you're done, you've answered the question. Also, if all the quantities in the problem are related to a single quantity, if everything is expressed in terms of a single quantity, make this conceptually central quantity the variable and then relate everything to that. Here's a practice problem. Pause the video and then we'll talk about this. Okay, at Greg's Groceries, a half gallon container of organic milk costs $1.50 more than a half gallon container of orange ice cream. Eliot bought 7 half gallon containers of orange juice and 3 half gallon containers of organic milk, spending $27 for all 10 containers. How much does a half gallon container of milk cost? And so, here we're looking for milk. So first of all, I'm gonna pick M for that. And that's my target value. In other words, if I find the value of M, I've answered the question. Now notice that the other variable, the price of juice, well, juice is $1.50 less than milk. Milk is more, so juice is less, so J = M- 1.5. And so everywhere where I would have a J, I can just substitute M- 1.5, and I can write everything in terms of M. So, the total price would be, M, the price of milk, times 3, and then the price of juice times 7, and if we add up all those together, it should = 27. So the price of juice times 7 + the price of milk times 3 = $27. So that's the single equation, and all we have to do now is solve that equation for M. We're gonna distribute, and notice that part of that distributing, we're gonna have to multiply 7 times 1.5. Let's think about this over on the side, 7 times 1.5. Well, 1.5 I could write that as 1 + 0.5. Well, 7 times 1 is 7. And 7 times 0.5, 7 times a half, half of 7 is 3.5. Well now I just have to add those and I get 10.5. So it's 7 times 1.5 is 10.5, so we can use that. So now let's distribute, we get 7M- 10.5 + 3M = 27. Let's first combine the 7M + the 3M, combine the like terms there. We get 10M- 10.5 = 27, add 10.5 to both sides and 27 + 10.5 is 37.5. Now to solve for M, all we have to do is divide by 10. And of course, dividing by 10, we're just sliding the decimal place one place to the left, so M = 3.75. Or in other words, a half gallon container of organic milk + $3.75, that's the answer. Here's another practice problem, pause the video and then we'll talk about this. All right, so you might be tempted to use variables S, J and P, but notice that everything is in terms of the fine. And so even though that's not the target value, it's gonna make sense to pick one variable for the fine because we can express what everyone paid in terms of the fine. So I'm gonna pick F for the fine. Pick F for the fine then we can express everything else in terms of that variable. So, we're told that Joe paid $3 more than one-quarter of the fine. So, F over 4 + 3. Peter paid $3 less than one-third of the fine, so F over 3- 3. And then Sam paid $4 less than half the fine, so that's F over 2- 4. And so all three of those shares should add up to the whole fine. In other words, if we add up this, this, and this, they should add up to F. So we'll just write that as a single equation. That's the equation for F. Just all the three contributions added, add up to the whole fine. Well, first of all, the +3 and the -3, those cancel. So we have a lot of fractions here. And life would be much easier if we got rid of the fractions. So we should multiply by something that will allow us to clear the fractions. And, you may remember this from the lessons on fractions, if we multiply by the least common multiple of the denominators. The least common multiple of the denominators is 12. 12 is the lowest number that's visible by 2 and by 3 and by 4. So we multiply every single term by 12. Well, 12 times F over 4 would give us 3F, 12 times F over 3 would give us 4F, 12 times F over 2 would give us 6F. And of course, 4 times 12 is 48 and then of course the F on the other side becomes 12F. I just add these 3 + 4 + 6 = 13, add 48 to both sides, subtract 12F from both sides, 13F- 12F is just F, so F = 48. So now we found the value of F. We have found the value of the fine. But that's not the answer, that's not what the question is asking. It's asking, how much did Sam pay? Well, Sam payed half the fine. Well, half is 24. He payed $4 less than half the fine. Half is 24, so he paid $4 less, Sam paid $20. And incidentally, if you're curious, Joe paid $15 and Peter paid $13, and that's how they covered the fine. In summary, do not use generic variables. Choose variables that will help you keep track of the numbers that in the problem. So the worst thing you can do is just pick x, because then you'll be wondering, once you find x, what did I find? Sometimes it helps to choose the smallest value as the variable, sometimes it helps to choose the target value as the variable. And if all the values are related to one quantity, choose that central quantity as the variable.